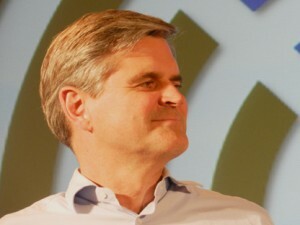 Capital Connection TechBUZZ ’12 Had Steve Case as the Keynote speaker at the end of the two days. In 1985 Steve Case founded AOL. It was the first internet company to go public, it was the largest media acquisition of its time. When crowdfunding was brought up he spoke about the ability to raise funds for projects via indiegogo or kickstarter Recently he has been spending a lot of time in Washington DC convincing the US Government to deal with entrepreneurial issues and American jobs. When asked how he feels about crowdfunding (JOBS Act) he mentioned the fact that it has been passed and is waiting for the SEC to finish their part. The law had previously stated that it was illegal to sell private equity to investors online. “You can sell the whole business – 100% but you will go to jail if you sell 1%” Case stated “for the first 6 years it was illegal for us to connect to the internet.” The JOBS act focuses on modernizing an extremely old system. In this short clip he discusses the benefits he sees in crowdfunding for startups and where it will may have the biggest benefit. As we are well aware, if you are in North Dakota, Philly, St Louis, Chicago, or Everywhere Else – it is very difficult to get covered by media outlets or to raise seed or angel capital. This is where we come in. We are planning on driving across the country for just over a year meeting with startups, incubators, accelerators, and their towns. While we cannot directly assist in helping you raise capital, we are sneaker strapped ourselves, we can help get your names out. We will come to your city and spend time with you. We don’t discriminate against a lack of funds being raised or lack of angels in your region. We only care about meeting startups who are making a go at something new.